Cmdr. Jason Cassisi, left, air boss aboard the aircraft carrier USS George H.W. 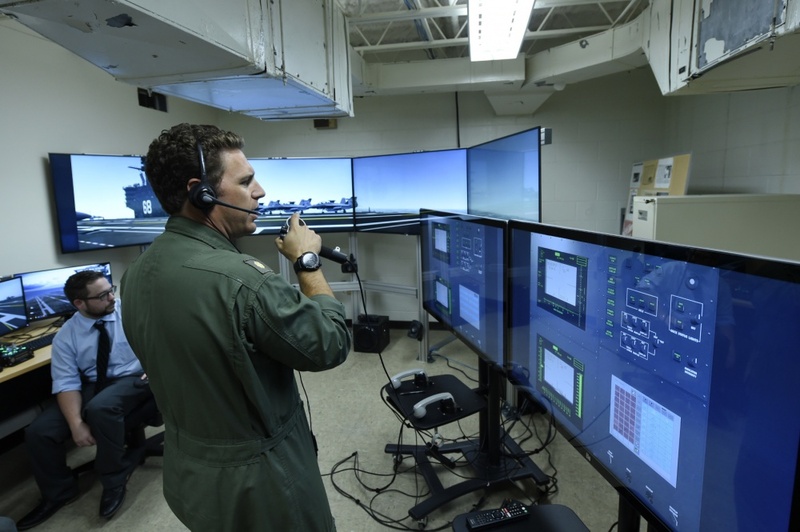 Bush (CVN 77) participates in a final prototype demonstration of the Office of Naval Research (ONR) TechSolutions-sponsored Flight Deck Crew Refresher Training Expansion Packs (TEP). TEP is an expandable framework of game engine-based immersive 3D technology that allows for individual, team, or multi-team training events. One of the most dangerous environments in the U.S. Navy is the deck of an aircraft carrier. Catapult systems that can remove limbs, furious engines, whipping propellers and high winds create a hectic environment. The driving force behind all of these activities is helping a pilot land an aircraft on a short slab of pitching steel, in the middle of the ocean. However as explained by Bobby Cummings, a contractor for ONR Corporate Strategic Communications, in the article Virtual Training for Aircraft Carrier Flight Deck Crews, although pilots are the stars of the show, they could not accomplish their missions without the support of flight deck crews, who are responsible for safely launching and recovering aircraft. Previously, flight deck crews could only conduct training while on the job. But thanks to a collaborative effort between the Office of Naval Research Global (ONR Global) TechSolutions program and the Naval Air Warfare Center Training Systems Division (NAWCTSD), a new technology called Flight Deck Crew Refresher Training Expansion Packs (TEPs) will deliver cutting-edge training to Sailors and Marines. The system is an expandable framework of game-based immersive 3D technologies that allows for individual, team or multi-team training events. The idea for the Flight Deck Crew Refresher Training came from an LSO instructor at Naval Air Station Oceana. TechSolutions—ONR Global’s rapid-response science and technology program that develops prototype technologies to address problems voiced by Sailors and Marines, usually within 12 months—listened to the idea and found the right people to make it happen. Courtney McNamara, a computer scientist and the Advanced Gaming Interactive Learning Environment (AGILE) Team Lead at NAWCTSD, helped develop the technology. Lt. Cmdr. 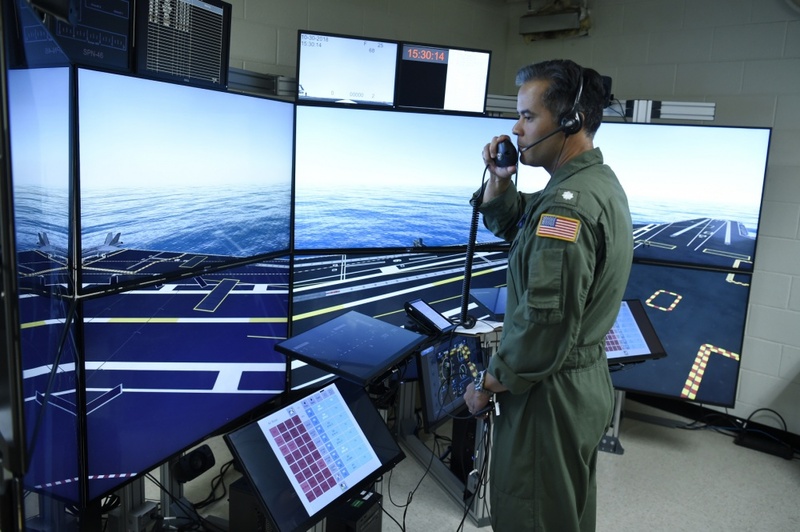 George Degennaro, assistant officer in charge at the Landing Signal Officer (LSO) School participates in a final prototype demonstration of the Office of Naval Research (ONR) TechSolutions-sponsored Flight Deck Crew Refresher Training Expansion Packs (TEP). TEP is an expandable framework of game engine-based immersive 3D technology that allows for individual, team, or multi-team training events. The training stations simulate real-life with the aid of virtual environments. Even the flight patterns that occur during the simulations are based on real flight patterns conducted by pilots. The following footage is a video demonstration of the TEPs.